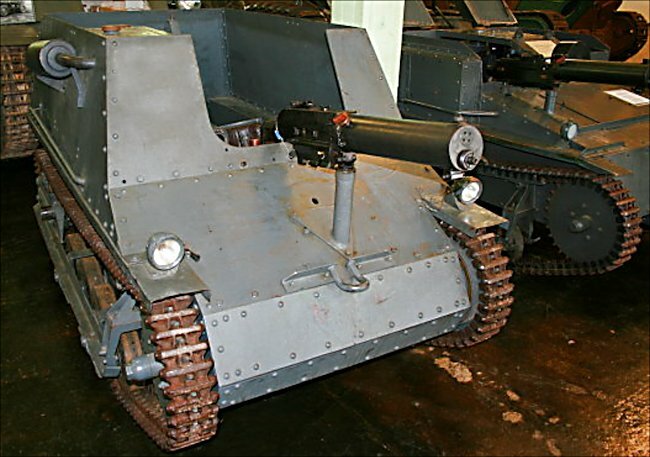 This is the only example of a Carden-Loyd Mark V* tankette left in the world and it is owned by the Swedish Tank Museum Arsenalen near Stockholm. At present it is not on display in the main museum but is kept in nearby storage. It can only be seen on special open days or by arrangement during weekdays. Two British made tankettes were purchased from the manufacturers Vickers Armstrong for evaluation purposes. One was this Mark V* and the other was a Mark VI, (which is on display in the museum). The Swedish Army wanted a tracked vehicle that could tow a Bofors 37mm infantry gun over rough ground. It was also used to tow ski troops in the winter. It was armed with a 6.5mm m/14-29 machine gun. The thickness of the protective armour ranges from 6 - 9 mm. It had a crew of two: gunner and driver. The Vehicle was powered by a Ford Model T four cylinder petrol engine. It had a maximum road speed of 25mph (45/km/h) and had a range of around 90 miles. This example was built in England in 1931 and shipped to Sweden. To start the Carden-Loyd MkV the gunner had to go around the rear of the vehicle and use a crank handle whilst the driver managed the choke and accelerator. 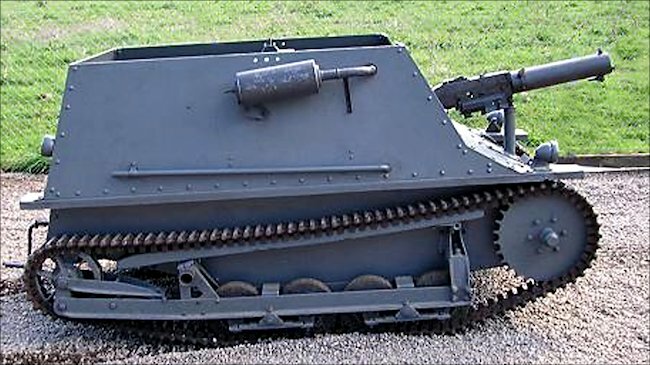 Swedish Carden-Loyd Mark V* tankette side view. Notice the crank handle at the rear of the vehicle. Although many people dismiss these small tankettes as toy like, in the early 1930s they were revolutionary. They gave the Army the ability to have a mobile armoured machine gun that could forge ahead of the infantry and blast a way through the enemy ranks. They were a much cheaper option than lots of heavy slow tanks. They could also tow infantry guns, be used for reconnaissance, carry ammunition and supplies to the battlefront in relative safety, transport military personnel and act as a medical evacuation vehicle. The Mark V was produced in eight different versions by Carden-Loyd tractors Ltd and was an upgraded version of the MkIV two man tankette. It varied from the previous version by being fitted with a novel tricycle wheel and track management system. Vickers-Armstrong was appointed as the company to produce these new vehicles. It weighed 1400kg. The open top feature of the vehicle helped keep the weight low. It enabled the crew to be able to have an all round view of the battlefield but made them vulnerable to air burst shells and grenades.